Kiteboarding is an adventure sport. It involves using a steerable kite that pulls you on a board on top of water, snow, or land. Most people use kiteboarding and kitesurfing interchangeably, but kitesurfing is a form of kiteboarding. Kitesurfing is coined from the idea that a kite acts like a wing or sail that uses the power of the wind to pull you across the water thus the term kitesurfing. Kiteboarding on land is usually referred to as kite landboarding while on snow it is kite skiing or snowkiting. Why should you participate in this sport? Which Kiteboarding Sport is safe for beginners? How much does it cost to learn Kiteboarding? Kiteboarding is a unique style of extreme sport. It does not only give you a rush of adrenaline, but it also works to tone your body. It increases your stamina by strengthening the upper body especially the abdomen and arms. It also increases strength in the legs to help you improve your balance. Kitesurfing, in particular, increases coordination, concentration, and improves your reflexes. This is because you have to navigate the water at high speed and have to be balanced at all times. You will also meet new people and appreciate nature. The 21st century has seen the revolution of kiteboarding. You will discover different types of kiteboarding kites used in this sport. Inflatable kites and foil kites are the two major categories. Foil kites are usually used in landboarding, snowboarding, trainer kites, and by foilboard racers. They use a double-layered canopy where they have closed or open cells at the location of the leading edge. They do not need inflating since the cells fill up with air as you launch the kite. These are kites designed to improve safety. They have a swept wing tip and a bridle on the leading edge. They are preferred for use by beginners as they offer more depower than other kinds of kites. These kites have a variety of riding styles since they support vast wind range, are easy to relaunch, and are excellent in upwind conditions. These kites have a square wing tip. They have little de-power which is not a good idea if you are a beginner. They have asmall wind range because they sit in the center of the wind window. Also, because of the long wing tips they have lots of power and lift. Freestyle enthusiasts prefer this type of kite since they have high performance in narrow wind ranges. This type of kite takes the best aspects of the C kite and the Bow kite and brings those aspects into one kite. That is; the power of the C kite combined with the safety and depower of the bow kite. They have a bridle and short wings. They also have automatic relaunch with excellent depower and wind range. These kites look more like more like a D with a swept back wing profile, but they have the power of the C kite. They have thick profiles which are short making it super easy to relaunch. These kites work with a variety of wind ranges which makes them applicable with many users including beginners. Wave kitesurfers and speed fans also love the feeling of kiteboarding with a Delta kite. Every expert had their first day. And when you want to learn a new sport like kiteboarding, you will want the best kit on the market. 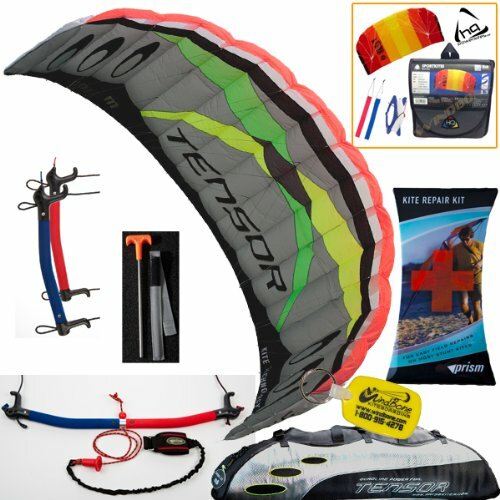 Prism Tensor 5.0 is a complete starter kit that comes with two foil kites for land and snow kiteboarding. It is a dynamic model that will go where the adventure takes you even with wind speeds are as small as 5mph. And when you want to explore higher speeds, this kite will unveil its stump pulling power to get your kiteboarding at incredible speeds. You have a set of two kites, a repair kit, and a WindBone kiteboarding keychain. As it is an exciting way to start your lessons, you will love the Prism Tensor as it has a 3-line control bar which you can easily convert into a dual quad handle for customized control. The wingspan is 173 inches with a sail area of 53.8ft. It is a good pick for light wind and soft snow. We like that it includes a dual-line control bar, quick release, and safety leash so you will not be going back to the store for the necessary accessories. Prism Tensor is a high-quality product which will save you investment costs and get you rolling in style. 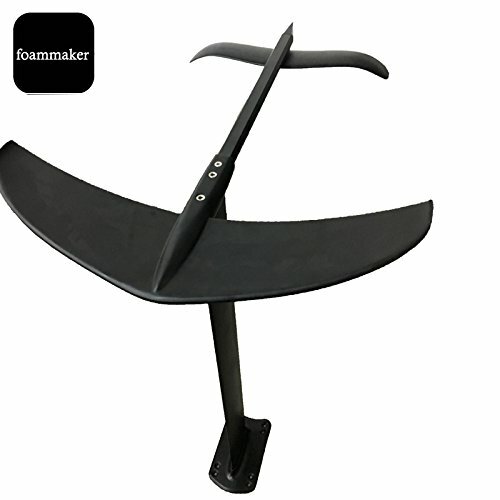 The Slingshot B2 Trainer Kite is perhaps the cheapest, quality model you will find on the market. It can be used on land, snow, and to a reasonable extent on water. It forms the basis where you can learn kite flying skills without putting a deep dent in your pocket. With a construction from ripstop nylon, this kite will face the elements, and it will not get torn if it falls on trees when there is no wind. You are supplied with a lightweight aluminum bar with foam padding. The control bar is light in weight meaning you get to launch your kite fast and kiteboard for longer since it won’t fatigue your hands. Even when your kite falls from the sky, you will experience simple relaunch with the Slingshot B2 since the lines do not tangle, and you can turn it effectively in light wind. 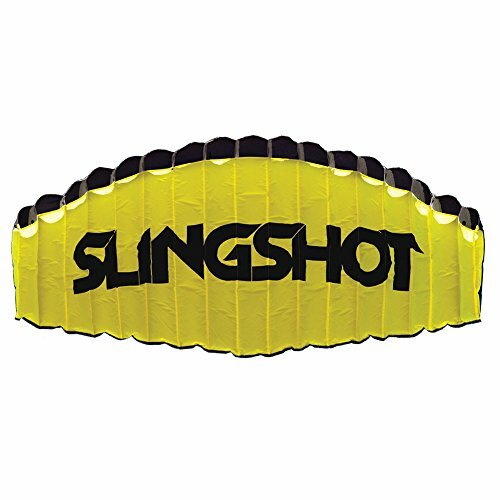 If you want to teach yourself kite skills for effective kiteboarding, Slingshot B2 gives you that exact opportunity. It is safe, durable, and comfortable to control. Are you looking for a new hydrofoil for your hydrofoil kiteboard? 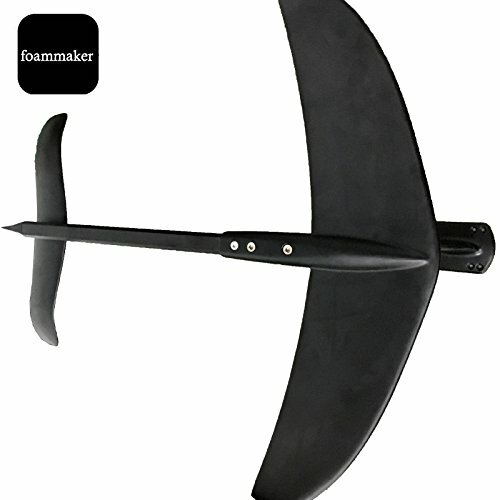 Foammaker introduces their wake foil designed for- you guessed it- wake foiling. Even as the world of skateboarding continues to revolutionize, hydrofoil boarding seemed like an impossible undertaking, but now you can kiteboard and get the feeling of floating on water with the help of a hydrofoil. Foammaker Hydrofoam has designed this foil to be robust and stable. It uses a combination of materials that include aluminum alloy and carbon fiber. These materials balance the weight where you get durability from aluminum and lighter weight from carbon fiber. It will feel comfortable at high speeds because of the reduced vibrations brought about by the use of carbon fiber. The wing design indicates it is for beginners. This is because it has a low aspect design which means it has a low top speed. It is a good thing since it has great stability and you can perform tricks on it. Most kiteboards are rarely what they say on paper in the real world. But Origin has stuck to their features with an improved design to deal with choppy waters. It is super fun to kiteboard with this board as it has a superior shape. 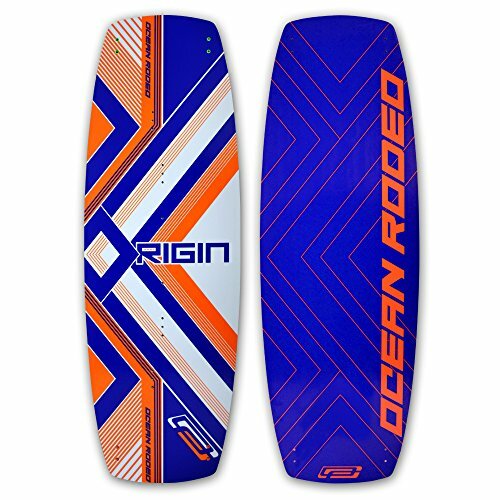 Oceano Rodeo Origin 3.0 is built for maximum performance. It has 33cm tips that provide good surf performance as it can carve and cut up wind. It has a medium flex which is great in choppy waters and kind on your knees. It is incredibly versatile since it adapts to your style as it is light and can move with your pace and skill set. The ABS sidewalls and blended wood core contribute to the board control when performing tricks or riding with a small kite. This kiteboard is equipped with the Bliss pads and straps. The footpad has foam dampening in the heel area while the foam ridge provides the best alignment for your foot. It also has a Velcro enclosure which completes the setup. Kiteboarding as we said is an extreme sport. If you have never surfed on water, used a skateboard or a snowboard, kiteboarding will be tricky because you need to learn both the kite and board skills. But it is usually 20% board skill and 80% kite skill. Kite landboarding is recommended as the safest bet for beginners. Kiteboarding on land is harder concerning safety but it is smooth, and you don’t require that much power to start gliding. This is the same case as snowkiting. In snowkiting especially, there is lots of power when gliding which translates to higher speeds. You may be going at up to 20-50mph which can be scary when you are a beginner. In water, kites encounter a lot of drag when entering into the water. You will also need to be confident in deep water. To learn control and balance, you will want to start with kite landboarding before switching to water or snow although water is softer than land. Kiteboarding involves learning a combination of skills. Although it is a bit complex, you will reap the rewards in due time. It will require buying the gear you need and choosing a school that teaches kiteboarding. Here, you are looking at an investment of $1000 to $3000 which is going to depend on the quality of gear you purchase. If you opt to purchase used equipment, it is vital to check that it is in excellent condition. Your gear will involve a kite, board, harness, lines, and bar. You will also need a life vest or personal floatation device (PFD) and a helmet. If the weather suddenly changes, you may also be required to have a wetsuit. A rash guard may also work in bad weather. Instead of buying everything in separate pieces, having a starter kit is much better. You will save money and you are assured that everything is a new working condition. Kitemares are a real thing. You have probably seen kiteboarding accidents on YouTube. But you can minimize the risks involved by having the right gear and following safety instructions at all times. Even pro kiteboarders can never be in control of the sport 100% each time. You should not kiteboard with any torn or rusty gear if you wish to have a smooth and exhilarating experience. Choosing the right kiteboarding and kitesurfing gear is all about your level of experience and physical ability. For beginners, you will like the convenience of shopping our best complete kit; the Prism Tensor 5.0. For those looking to experience more speed, you can add the Foammaker Hydrofoil to your setup. It brings more possibilities in what would be a smooth surf without adrenaline rushes. 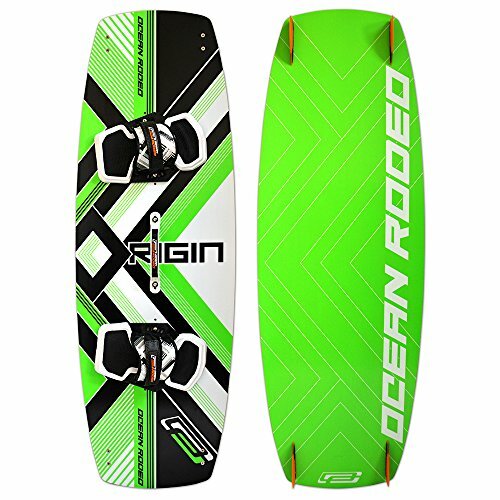 And don’t forget to perform tricks on a capable kiteboard like the Oceano Rodeo 3.0 kiteboard.